John Cooper is a name that carries a lot of weight in MINI lore. Back in the early 1960s the Formula One constructor turned his attention to the original Issigonis Mini and turned the Mini Cooper S into a rally-winning icon. 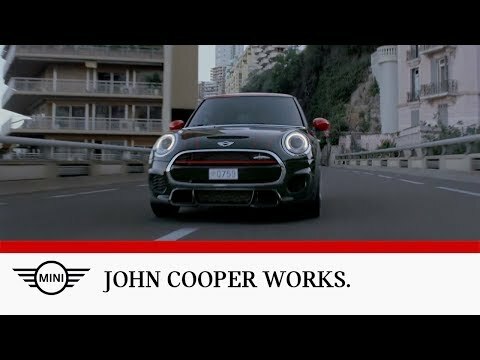 Today, John Cooper works - JCW – pairs the spirit of MINI with its hottest, most powerful drivetrain yet. Unmistakably MINI yet distinctively different, the JCW MINI has an aggressive stance with an enlarged mesh grille at the front, standard LED headlights large air intakes and a rear spoiler. The unique JCW bodykit includes front and rear bumpers and side sills, with chunky wheel arches covering those alloy sports wheels. The latter are 17” as standard with 18” available as an option (a far cry from the original Cooper S 10” wheels). The front, side and rear of the car all feature John Cooper Works badging. Inside, seats are trimmed in Carbon Black Dinamica fabric, with leather as an option. The multi-function steering wheel and door sills also feature JCW logos. Stainless-steel pedals complete the sporty ambience. The latest JCW MINI is powered by a 2.0-litre turbocharged engine that’s up by 10 percent on peak power and 23 percent on torque, thanks to new induction and exhaust systems, new pistons and a new turbo. 0-62mph takes 6.3 seconds, the engine produces 227bhp and 147 g/km CO2 and top speed (if you’re planning a trip to Germany’s de-restricted autobahns) is 155mph. As if only proper for a MINI, drive is to the front wheels. Split driveshafts allow the fitment of equal length halfshafts which helps the steering feedback when those 227 bhp are being used to the full. Front suspension features a host of changes including uprated springs and dampers, while the rear multi-link suspension is also lighter and tougher. Optional variable damper control replaces the standard passive shocks with twin-reservoir switchable units. Brake-activated torque vectoring performs the duties of a limited slip differential. The John Cooper Works MINI is well equipped as standard, with aircon, heated mirrors, DAB radio, Bluetooth and USB connectivity and cruise control. The Chili pack adds climate control, velour floor mats and automatic wipers and lights while the Media pack includes Satellite Navigation. The Tech pack comprises parking sensors, a reversing camera and an upgraded Harman Kardon audio system. Six airbags are standard, as is a Thatcham CAT 1 immobiliser and Tyre Pressure Warning. Driver systems include Dynamic Stability Control, ABS with Cornering Brake Control and brake drying to sharpen up braking response in wet conditions. Intelligent emergency calling (E-call) summons help in the event of a heavy collision. One of the clever things about MINI ownership is that there are myriad ways to make it that even more distinctive. Starting with the JCW MINI means you’ve already got a head-turner, but you can give it even more cred with a carbon-fibre bonnet air intake and carbon-fibre door mirrors. Want more? How about a John Cooper Works Roof graphic, repeating the chequered flag motif, or JCW side stripes and scuttle badges in a bewildering range of colours and designs? If you can’t turn your JCW MINI into a limited edition of one, you’re not trying hard enough. Away from the car itself, you can also show your allegiance to all things JCW with the John Cooper Works Lifestyle Collection. This includes a range of authentic, premium clothing and personal accessories from watches to water bottles.